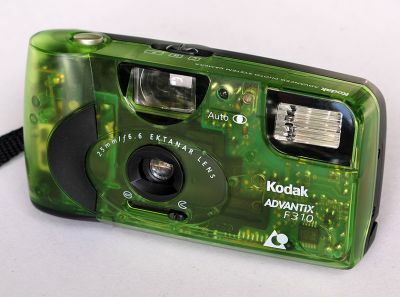 Cameras Downunder Gallery - Transparent Cameras & Disaster Survivors/Kodak Advantix F310. camera. Green Kodak Advantix F310. Advanced photo System (APS) camera in . all plastic and transparent. Lens: 6.6/ 25mm Ektanar.